Implementing a quality management system is as much as an art as it is a science. It is an art to manage people and a science to have a process approach to quality. 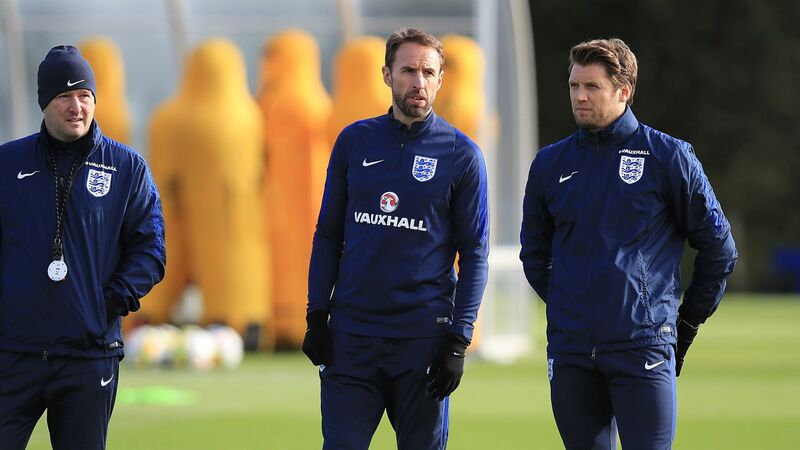 In this article Qualsys' Business Mentors Mike Bendall and Peter Pond discuss implementing a quality management system and answer your frequently asked questions. With experience implementing and consulting with organisations of all sizes, they offer an expert perspective on successfully implementing a new quality management system. It sounds like a obvious question, but let's start wtih the basics by defining and discussing the scope of a quality management system. 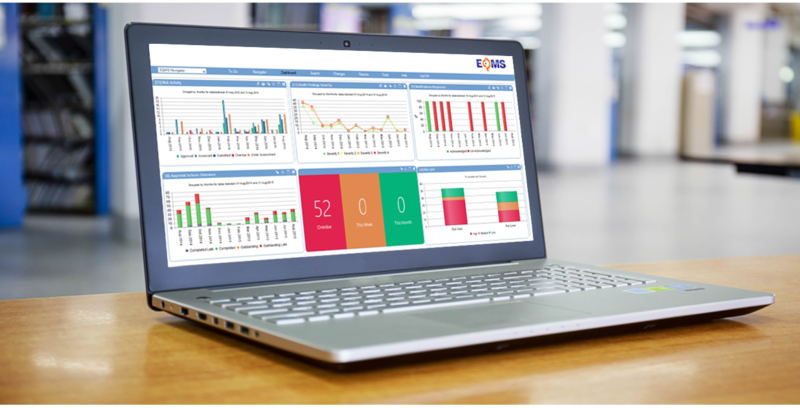 "A QMS is a coordinated set of values and processes implemented by an organisation to ensure and demonstrate that it meets the standards demanded to satisfy its customers’ demands and expectations." Why is a QMS important? What are the benefits of implementing a QMS? How does a QMS support an organisation to manage cultural issues? Implementing a quality management system can ruffle the feathers of employees. It can take them out of their comfort zone and away from institutionalised processes. This is why support from operational and executive management from the outset is critical to the implementation of a quality management system. 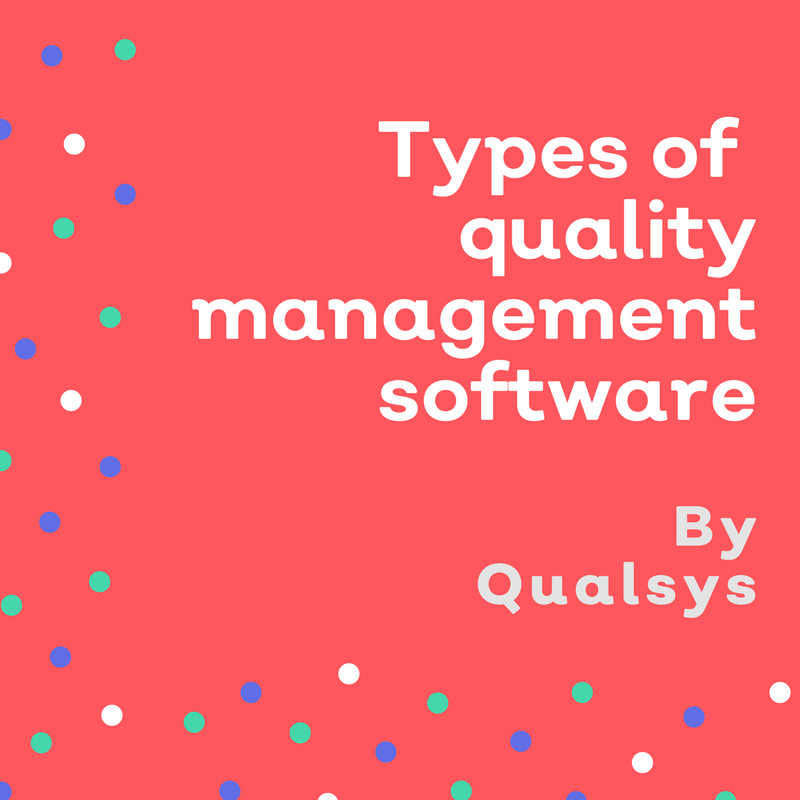 Qualsys has worked with hundreds of quality managers and always found that it is best practice to get management to promote quality. It is advisable for managers to embark on a routine of positive reinforcement during the early stages of the systems life. Not only will this promote system use but it will motivate staff. Download our stakeholder engagement template for a step-by-step plan to getting buy-in from your internal stakeholders. To be effective, a quality management system needs to be robust, intuitive and flexible. The diagram below demonstrates how Qualsys's software modules interact to reinforce a holistic QMS. Under a QMS, processes should be subjected to tighter management. It is wise to expect changes in the way staff interact and to expect changes in the distribution of responsibility and accountability. It is important to take account of staff perception. Recognising existing employee attitudes and dispelling any concerns they hold is a vital part of managerial strategy when implementing a QMS. Building on the theme of staff communication, when implementing a QMS an organisation should not shut its ears to employee suggestion. Employees are the ones who will use the quality management system so making any necessary amends to fit their needs and improve usability makes sense. It is also advisable for an organisation to allow for an initial lag phase before improvements become the norm. 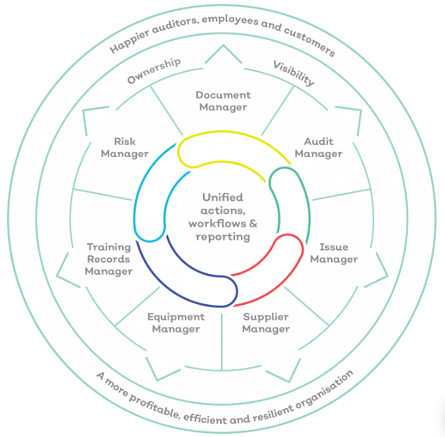 A quality management system offers peace of mind that regulatory requirements are being complied with and that the organisation is continually adopting a customer-centric approach. Read our blog article "The Transformational Quality Professional - Moving the Business Forward" for more information. 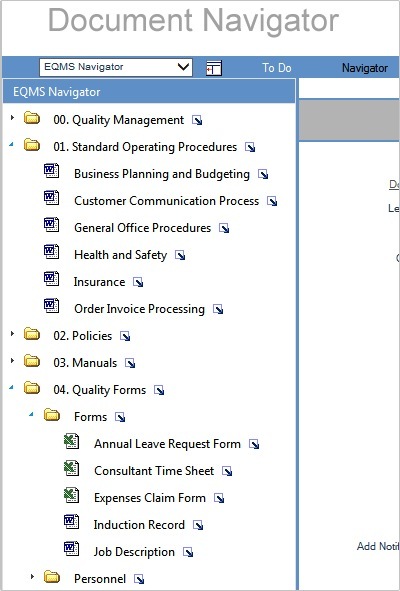 What does a QMS require? A quality policy and quality objectives. These statements must be documented. A quality manual including scope, justifications for any exclusion, documented procedures and process interaction descriptions. This will specify how a QMS will be observed and emphasise the company's commitments to both continuous improvement and quality. Any document procedures required by the compliance standard. Any documents needed to ensure the effective operation, planning and control of company processes. Records such as evidence of conformity to requirements and of effective QMS operation will be required by the compliance standard. To ensure compliance standards are met, all company documents should conform to QMS processes. This will ensure conformity in staff behaviour when performing their duties, a uniform data recording method and consistency in staff training. The keeping of records such as audit findings, data monitoring, non-conformance reports and corrective actions etc. can be used as proof of QMS use and effectiveness. A QMS can be used to enforce the required approval and disposition of documents and records. It is important that only the most up-to-date version of documents are available to company users. To be compliant documents should have unique identity and version control when subjected to change. The signatures of authors and approvers of the document may be required. A summary of document history showing changes and dates of revision may be required. 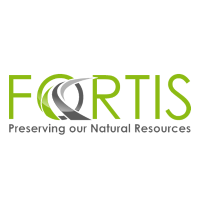 To ensure that all records are both traceable and retrievable, records must be managed and controlled in a similar manner to documents; it is advisable to assign them unique identifiers, which will be supplied by an electronic QMS tool. General templates for all Controlled Documents that the company plans to use should be drawn up before QMS documents are written. Templates should have consistent styles and formats thus making them easy to read and navigate. All template procedures and instructions should have purpose, scope and responsibilities sections, templates must also meet controlled document requirements e.g. unique identifier etc. It is optional for a company logo to be included in a document header. Many companies will have written procedures already in place, however these current procedures may not be up to scratch in terms of being out of date, incomplete etc. There may be some areas of the business, such as finance, that are not seen to fall under the scope of the QMS and existing procedures may be seen as the best option to achieve compliance. However any areas deemed not under the remit of the QMS must not have an impact on product safety of quality as these are under the jurisdiction of the QMS. Companies should undertake a flowchart-style mapping of quality framework management processes. This helps to include all stakeholders in the process, highlights areas of non-compliance and missing documents, and is a great method of identifying areas where change is needed. It is useful to map your QMS documents and structure according to hierarchy using process/document maps and organisation charts. Documents should be drafted according to the specifications in the document maps; be aware of your audience and use appropriate language accordingly. A large international company with bilingual staff may need to publish documentation in several languages. Electronic drafts should be managed appropriately. They should be documented and filed so that they can easily be identified, retrieved, reviewed, tracked and managed. The process used in the document control mechanism should be consistent to that used in the drafting process. It is important for all documents to be reviewed by Subject Matter Experts from all areas affected by the document scope. Failure to review documents may result in a reduction of compliance, increase the risk of deviation from the QMS and create friction between staff/departments. It is important to obtain the appropriate approval level for an issued document, this will be dictated by the compliance standard. Once issued and approved a hard copy of the document must be filed at a secure location. Once documents are published staff can be trained to use them. There's a wealth of QMS information online. 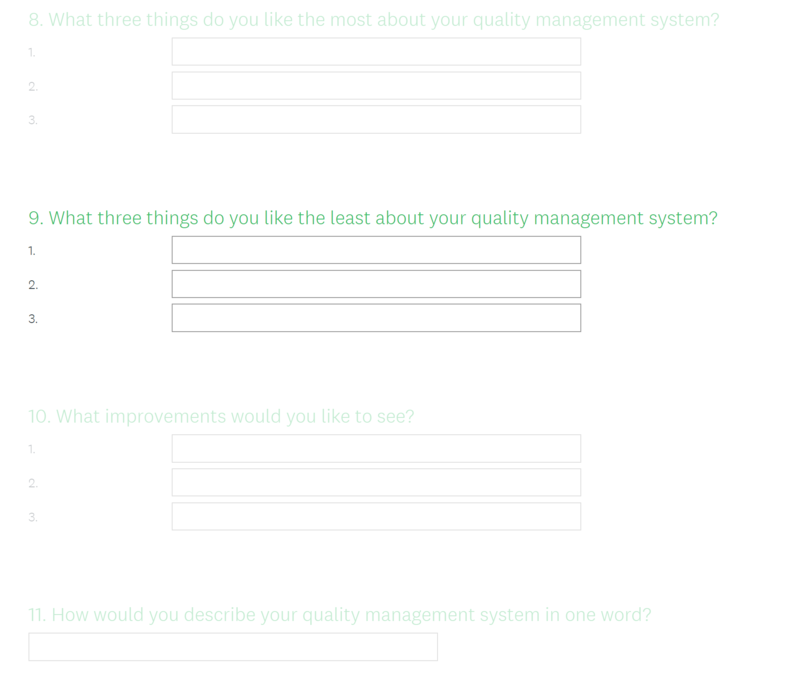 Try starting with GreyCampus's 'Steps for implementing a quality management system - the successful way!' article. Essential to the successful implementation of a quality management system is stakeholder engagement. Download our template below for more information. Not sure what quality management system you need? Use this list of different types of quality management systems. Use these 4 simple steps to get buy-in for your GRC software solution. Includes lots of free resources, created with help from leading global brands. Are your quality performance indicators focusing enough on your brand's reputation? Probably not. Here's how to use NPS to improve your brand's reputation. What quality performance indicators should you be measuring? Here are three KPIs to consider.